Jeannine Mickeleit will transform the former Portofino coffee shop located at 2550 W. Stadium Blvd. into her second Biggby Coffee franchise in Ann Arbor. Ann Arbor will get another Biggby Coffee location by March, this time on the west side of Ann Arbor in the space formerly occupied by Portofino Coffee. 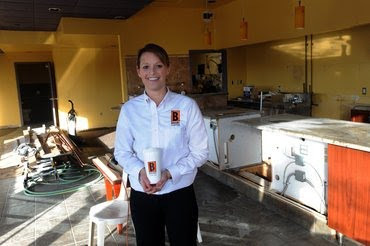 “We will be taking over that space,” said Jeannine Mickeleit, who also owns the Biggby franchise on Plymouth Road in the Upland Green complex. Mickeleit signed a lease in December for the former Portofino space, 2550 W. Stadium Blvd., just southeast of the Jackson Road intersection (see map). The building is perfect for a new coffee shop, said Susan Moore of Colliers International, who worked with Mickeleit and listing agent Jim Chaconas on the deal. Since the space was formerly used for a similar function until Portofino closed last spring, the configuration suits the coffee shop layout, Moore said. The transformation of the shop started in December. In addition to cosmetic changes, it also needs new equipment that fits the Biggby formats. 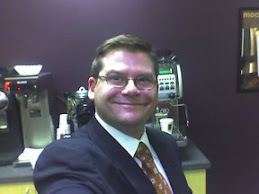 The coffee shop has at least 100 outlets in six states. The West Stadium store will eventually employ about 15, Mickeleit said. She’ll also split her time between her two franchises. She also hopes to open a third store in Ann Arbor. Another franchise group operates stores on East Liberty and Washenaw Avenue. Coffee shops have been closing across the U.S., including hundreds of Starbucks stores in 2009. Local changes in the past year include the closing of Portofino, Primo Coffee on East Liberty and an Espresso Royale on Carpenter Road. And while the independent coffee shop didn’t last in the space, the Biggby brand - growing in several states amid aggressive marketing support from the East Lansing-based corporate office - should made the difference for Mickeleit, Moore said. Mickeleit agreed. While there are several eateries in the West Stadium corridor, she pointed out the lack of a traditional coffee shop on the corridor. Paula Gardner is Business Director of AnnArbor.com. She can be reached by e-mail or by calling 734-623-2586. Follow her on Twitter. Jeannine--this looks like a great spot with big, open spaces for comfy seating. Very cool! Fabulous. 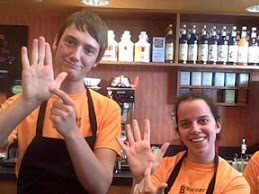 Glad to hear that another Biggby will be in Ann Arbor and in my old neighborhood. Come on by in a few months and you can check out the store and the comfy seating! It would be my pleasure. I guess the Jeannine character knows how to get in the paper. She probably also has something wise to say to her customers when they walk in the door. I've met this lady and nothing, and I mean nothing, gets by her! Seriously, I hope for only the best for Jeannine, She works hard at it. I wish you all the luck in the world with the new store opening. Sounds like it should be a blast. Remember while your working hard to have tons of fun! Good luck Jeannine. If I am ever in the neighborhood I will have to stop in.